It’s time to once again open the Geek Alabama super-dooper mail bag! And I have two e-mails from supporters who want to see Oxford, Alabama put back up the classic 4-way traffic lights that were taken down in the downtown area. Currently, the three intersections that had the 4-way lights are now controlled by a 4-way stop sign. Right now, downtown Oxford is going through a streetscape construction project. Some city officials are thinking about keeping the 4-way stop signs and never using these classic 4-way traffic lights ever again. And it would be a huge shame, because they look beautiful! This first letter from a person who wants to remain anonymous wrote two letters. The first is to Oxford Police Chief Bill Partridge. You may have seen Sunday’s Anniston Star story about my efforts over the years to help Oxford preserve its historic Main Street stoplights, bring them into compliance with the federal traffic code’s double-light requirement, and retrofit them with LED lamps. In the event Mayor Craft didn’t share it with you, I have attached my July 20 letter to him regarding these lights. In addition to aesthetic and historic reasons, I believe these traffic signals should be reinstalled on Main Street for public-safety reasons. The Star story quoted Councilwoman Hubbard as saying the interim stop signs have slowed traffic downtown and this “has led to more shoppers at businesses in the district.” I have no idea whether this is true, but in my many years of streetscape planning and design I have never seen a switch from signals to stop signs trigger a boost in retail activity, and I find this to be unlikely. But here’s what I have seen: When you create all-way stop situations at consecutive, closely-spaced intersections on busy streets, you frustrate motorists and breed contempt and disrespect for the stop signs. This results in motorists violating the signs, which would be at odds with Oxford’s goal of encouraging pedestrian activity on Main Street. And I’m very familiar with this situation firsthand because I was born and raised in the stop-sign capital of the United States: St. Louis. St. Louis is notorious in traffic-engineering circles for its overreliance on stop signs and all-way-stops. I would like to see Oxford reinstate the historic signals at its 3 downtown intersections, but not the old signal controllers. The old mechanical controllers should be replaced with new computerized controllers that offer advanced programming and emergency-vehicle preemption. I would also offer this suggestion: Operate the signals in full-color mode during the day when shops are busy and pedestrian traffic is highest. This would provide greater safety – and perception of safety – for walkers and encourage pedestrian activity. But at some point in the evening, when pedestrian traffic drops off, operate the signals in flash mode – yellow flash for Main Street and red flash for the cross streets. This should please residents who don’t wish to wait at red lights at night when there is little or no justification for them. And this person also wrote a letter to Oxford Mayor Alton Craft. I suspect you may remember me as the historic preservationist and streetscape designer who convinced Leon to save Oxford’s historic stoplights on Main Street many years ago. After all, you and I spoke on several occasions about these lights, too. It took nearly 20 years, or 40% of my lifetime, to accomplish the goal of getting these lights protected and refurbished and brought up to code, but I felt very gratified when Leon and Don Hart told me in 2010 that the signal project was essentially completed. After working for so many years to safeguard these rare and distinctive lights for the people of Oxford, it would break my heart to see the City abandon them when they could continue to make such a valuable contribution to Main Street’s historic character. I understand these lights have been removed from service at Oak, Choccolocco, and Snow/Spring streets during the Main Street facelift, but that a final decision has not yet been made as to whether to reinstall them after the project is completed. My hope is that the City will reinstall them. The 4-way signals on Main Street are rare collector’s items, manufactured by the Eagle Signal Co. of Moline, Illinois, and the Crouse-Hinds Co. of Syracuse, New York, in the 1950s and 1960s. They are all 50 years of age or older and therefore meet the federal government’s definition of historic. These signals have become so rare that not a single one remains in operation in most of the 50 states. Alabama actually has more than most states, but even in Alabama, I know of only 7 cities that still have any in service: Selma, Gadsden, Athens, Tuscumbia, Oxford, Anniston, and Bay Minette. These signals are still legal – still allowed by the federal highway traffic code – and their aluminum shells will last indefinitely. Their high-quality materials and craftsmanship explain why they are still functioning after 50-60 years. Moreover, Temple Electric Co. has already relamped at least 4 of Oxford’s 10 historic signals with bright, energy-saving LED lamps. With the LED retrofit, these signals are essentially now state-of-the-art, but they retain their “period” look. Oxford should ask Temple to relamp the other signals. Bardstown, Kentucky; Gadsden, Alabama; Greenwood, Mississippi; and Ravenna, Ohio. You will note that the support poles are either steel or concrete and offer a clean appear-ance, and the span wires are strung neatly. The 2 historic signals that were retired earlier from Main & 4th had some damage but were largely sound and should not be discarded. They could provide critical replacement parts for the City’s other historic signals. Would you please inquire about these lights and ask that they be stored in a safe, secure, indoor place? The 2 historic signals that were removed from Main & Snow/Spring have not, to my knowledge, been relamped with LEDs yet. Now would be the ideal time to have Temple perform this retrofit, while the lights are out of service and before they are (hopefully) returned to service. You wouldn’t want to install modern mast-arm signals at your Main Street intersections because these would cost a fortune and would clash with the historic buildings. And you wouldn’t want to switch to stop signs because stop signs don’t provide pedestrians with the same sense of security or adequate amount of protected time for crossing streets. Gadsden Public Works Director Brian Stovall played a key role in the preservation of Oxford’s lights some years ago. 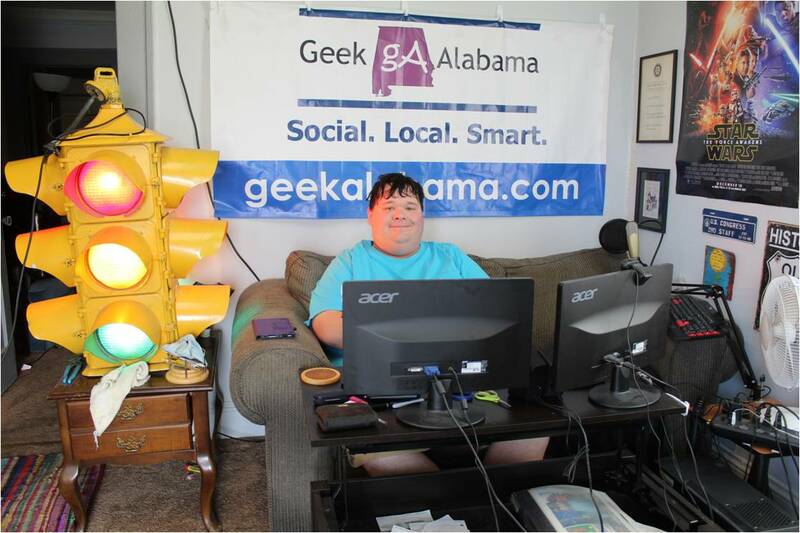 He is fond of vintage signals and is doing a good job of maintaining the 21 in Gadsden. I’m sure he would like to see these lights return to Oxford’s Main Street. To cut to the chase, I’m one of a number of people who encourage the refurbishing of appropriate vintage traffic signal equipment for purposes of both cost savings and to preserve historical ambiance, particularly where they contribute to a desired atmosphere of a downtown shopping district (in efforts to contrast these older districts with more sterile strip malls,) and/or to meet the preservation expectations of citizens. Some ten years ago American City and County published the feature, “Four-way traffic signals save money, preserve historic atmosphere.” That article raised consciousness about some of these older pieces of “street furniture.” I then became aware of Oxford when some Alabama historical enthusiasts sent me images after I posted a link to the American City and County article in one of the street and traffic discussion groups. If you google Oxford, AL, a number of the images that are returned show your historic traffic signals. That’s because people like photographing them, usually visitors from out of town. They post them to social media where Google “harvests” them for its search engine. Here are just a few samples that appeared this morning. In viewing the evolution of urban streetscapes, a recurrent pattern involves the push to modernize or alter traffic management, dispose of previously used equipment including historic signals, then scramble to reconstruct these older styles once the original signals are no longer available. Clearly there are counter-balancing issues such as MUTCD standards with respect to directed movements, maintenance issues (LED vs. incandescent indications,) changing traffic patterns and pedestrian protection. However, if the older equipment is disposed of or is carelessly stored, a city’s cost savings is permanently lost in the event a streetscape proposal calls for a more traditional look. The purpose of my taking the time to compose this message is two-fold. First, I encourage you to carefully store and preserve the four-way equipment that you have removed. It can actually be quite valuable, if not for repurposing in your own city, for use as trade stock for other communities that want to preserve or recreate that mid-century streetscape feel. Second, these artifacts if properly restored can be included in more modern approaches to historic streetscape designs as illustrated below. Athens, AL. Recycling Eagle 4-way signals after utilities have been placed underground in an intersection that also incorporates pedestrian indications. Span wire upgrades: 1950s vintage Crouse-Hinds signals retrofitted with LED optics, with pedestrian indications post mounted on street corners, Chapel Hill, NC. In summation, Oxford has (or hopefully still has) an inventory of historically valuable traffic signals. I strongly urge you to thoughtfully preserve that hardware for eventual reuse when considering historic streetscape designs in your business district, and even to use for low-cost and reasonably attractive signaling in residential areas as opposed to cluttering the sky with eight or more single face heads. LED optics can meet all current MUTCD standards for lower-speed urban streets and generally speaking, most of these older signals were well constructed and in some instances will outlast some of the more cheaply made modern signals. I hope you will consider this unsolicited advice as the city has some valuable historic artifacts that hopefully will not end up in the recycle bin. I have also found several other people who support hanging back up these classic traffic signals. So, what will the City of Oxford do? They have had a history of doing things “their way” and not listening to other people suggestions. I guess time will tell. If you support seeing Oxford putting these classic 4-ways back up, contact the mayor and city council at this link!